Spinal injuries, tumors, and infections of the neck (cervical spine) can be life threatening. Collaboration with the oncologist (tumors) or infectious disease physician (infections) is an important component. Surgical excision of the damaged spine is crucial to remove the pressure on the spinal cord and nerves, as well as reduce the disease load or burden. At the same time, reconstruction of the spine with titanium screws and rods acts to stabilize the affected segment of the spine. The surgery can either be performed from the back, front, or both approaches. If it is both approaches, they can either be done on the same day or staged (i.e. done at two different timings about 5 to 7 days apart). 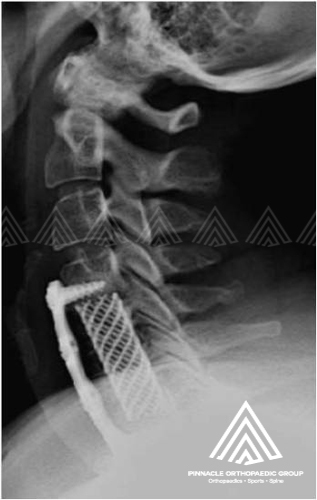 If they are performed from the front, the most commonly performed surgical procedure is anterior cervical corpectomy. Cervical corpectomy (Figure 1) is an operation to remove a portion of the vertebra and adjacent intervertebral discs for decompression of the cervical spinal cord and spinal nerves. In some patients, the cervical spinal canal can be narrowed by various pathologies arising from the back of the vertebral body or the ligament behind the vertebral bodies. In this situation it may be necessary to remove one or more vertebral body and the discs above and below to adequately decompress the spinal cord and/or nerve roots. 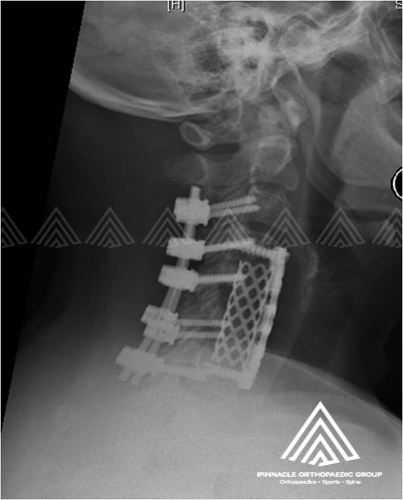 A bone graft with metal plate and screws is used to reconstruct the spine and provide stability. Sometimes, the procedure from the front is combined with a back procedure (Figure 2). Our doctor Adjunct A/Professor Hee Hwan Tak is a renowned spine surgeon with much experience performing such procedures at Singapore Pinnacle Orthopaedic Group. Contact us for a comprehensive consultation for your spinal injuries, tumors, and infections of the neck . Visit Dr Hee Hwan Tak’s Google+ page here. Sporting activities can sometimes result in spinal injuries. On the Frontline programme, Dr Hee discusses on the risks of spinal injuries.